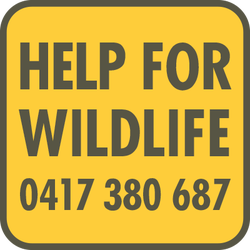 Help for Wildlife has been operating as a 24 hour state-wide Wildlife Emergency Service for 20 years. We are an incorporated, non-profit organisation which is not Government funded and does not have paid staff. All works carried out by Help for Wildlife are undertaken by trained, dedicated and focused volunteers and professionals. We have at our disposal through professional links and partnerships, access to key expertise in wildlife veterinary care, wildlife management and work on endangered and threatened species. Help for Wildlife takes a multidisciplinary approach to issues relating to wildlife and are keen to facilitate and educate in order to achieve sustainable outcomes and solutions to wildlife state-wide. Help for Wildlife is on 24 hour standby to attend disaster situations involving wildlife. Our fully equipped mobile veterinary response unit, the only one in Victoria, is custom designed to facilitate rescue and emergency care in all disaster situations such as; bushfires, floods,heat stress events and oil spills. All our emergency personal are highly trained in these fields.